The Essential Healthy Gut Diet Recipe Book: A Quick Start Guide To Improving Your Digestion, Health And Wellbeing PLUS Over 80 Delicious Gut-Friendly Recipes! Your gut is astonishingly clever. It contains millions of neurons - as many as you would find in the brain of a cat - and is home to the microbiome, an army of microbes that influences your mood, weight and immune system. In this groundbreaking book, Dr Mosley takes us on a revelatory journey through the gut, showing how junk food and overuse of antibiotics have wiped out many "good" gut bacteria, leading to a modern plague of allergies, food intolerances and obesity., Setting the record straight on everything from prebiotics to probiotics, fermented foods to fasting, Dr Mosley provides scientifically proven ways to control your appetite and boost your mood. 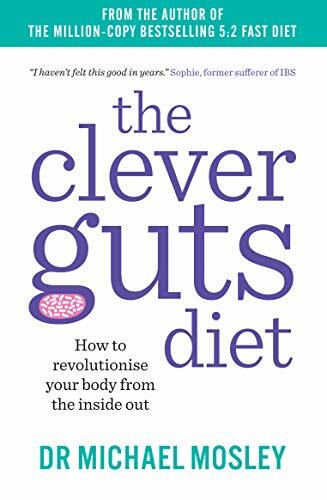 The Clever Guts Diet is packed with delicious, healing recipes, menu plans, checklists and tips - all the tools you need to transform your gut and change the way you eat for ever.